Target will be cutting the price of the iPhone 5c down to $49.99 from $79.99 starting this Sunday, October 13, reports CNET. Customers who have a Target REDcard can save an additional five percent on the device upon purchase. The move follows a rapid string of recent price cuts for the lower-cost device, inclduing Best Buy and RadioShack knocking the price of the device down to $50 with a gift card while Walmart dropped its own pricing to $45 through the holidays. Yesterday, it was reported that Apple is cutting iPhone 5c production from 300,000 units to 150,000 units per day, with the lower-cost iPhone 5c seeing significantly better availability compared to the high-end iPhone 5s. It is, however, unclear how much of the plentiful iPhone 5c supplies are due to weak demand and how much is due to Apple simply having met demand through more effective production. Apple announced last month that the iPhone 5s and iPhone 5c had sold a record nine million units during the launch weekend for both devices, but the company did not break down the sales distribution between the two models. 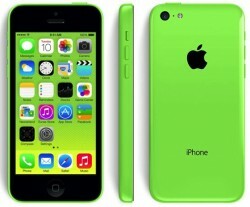 However, a report from earlier this week did state that the iPhone 5c finished second in sales over the month of September at US carriers AT&T and Sprint, and finished within the top three in sales at all four major carriers, which suggests that the lower-cost iPhone is at least selling fairly well.